The CEO of An Post told an Oireachtas Committee today that it is vital now that more government services are offered at post offices to strengthen the network. Minister Naughten told the committee today that he did not "shirk away" from his responsibility as minister to save the post office network. 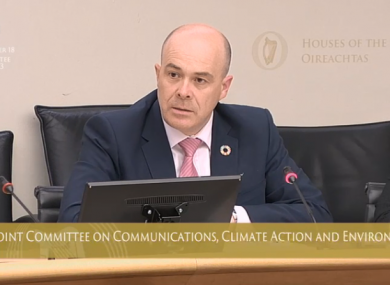 MINISTER DENIS NAUGHTEN has said that without the recently announced closure of 159 rural post offices, the country would be faced with the complete shutdown of postal services. Last week An Post announced the post office closures, which affect 25 counties. The post offices will close following the voluntary retirement of the local postmasters, which An Post said were agreed as part of historic agreements with the Irish Postmasters’ Union. The company said that services in the closed post offices will be consolidated in the nearest available office that remains open. There has been widespread criticism of the plan, which has been labelled as an attack on rural communities – in particular the vulnerable and elderly people living in them. Today the minister defended the plan, telling the committee that 97 weeks ago he was “presented with a future for An Post and the post office network that was uncertain and extremely bleak”. I was determined the company would not go under – which was a very real possibility – on my watch because of the failure to act by successive governments. The potential for a complete shutdown of postal services with the loss of thousands of jobs was undeniable. “Immediate action was needed. It was needed to ensure the survival of An Post. It was needed to safeguard the post office network. It was needed to protect thousands of jobs across the country,” he said. An Post has given a commitment that every community of over 500 people will have a post office and 95% of the population would be within 15 kilometres of at least one other Post Office. Naughten said he has argued strongly for the need to channel more government services to the post office network to strengthen it. Also addressing the committee, David McRedmond, CEO of An Post, said it is vital that more government services are on offer at post offices. “It drives me nuts to think that something like driving licences are not available in post offices,” he told the committee. He said he understands concerns about rural communities and this was why An Post had committed to maintaining 960 post offices, “the best rural network of any postal service we know of”. “Our social commitment is not just words,” he said, but he added that in order to succeed, a post office needs customers and products, and some simply were not viable anymore. Before Minister Naughten and McRedmond’s appearance before the committee, it had heard from representatives from the Public Banking Forum of Ireland, which suggested community banking as a model that could support the post office network. The public banking model was rejected by the government in a report published by the Department of Public Expenditure and Reform in July. It said there was not a “compelling case” for the State to establish this system, which it estimated would cost €170 million. Responding to questions about this idea, McRedmond said there were no services offered by public banking that were not already offered, or would not soon be offered, by the postal office network. Equally, Minister Naughten said he believed it was “disingenuous” of people to ignore the community banking model Ireland already has – the credit union. He said it is important in the context of this discussion to talk about how to engage with the credit union movement and work to enhance it. Speaking ahead of the committee meeting today, members of the Rural Independent Group said there must be accountability for the move. Tipperary TD Mattie McGrath said that the government had a history of shameful ambivalence toward the post office network and that there must be political accountability for the move. Kerry’s Danny Healy-Rae said the closures would tear the “heart and guts” out of rural Ireland, and that the guarantee that people wouldn’t have to travel more than 15km to access post office services was cold comfort. “What good is that for an old person collecting their pension? They’ll have to hire a taxi maybe pay €30 or €40 and maybe a fifth of their pension gone just to collect their pension. That’s no good to people in rural Ireland,” Healy-Rae said. Naughten also attended the first Cabinet meeting since the summer break in which he got Cabinet approval to set up working group to investigate what departments would benefit from offering offline services. A government spokesperson said many members of the public, particularly the elderly, do not use the internet to access government services. It is envisaged there should be “one stop shops” for people with no internet access. The working group will investigate the roll out of offline services, such as providing a motor tax renewal, driving licence renewals, and M50 toll payments. It will also seek to determine where would be the best place to access such services, such as post offices. The working group on the roll out of offline services is due to report back to the minister. Email “Naughten says complete shutdown of postal services was 'undeniable' before retirement package plan”. Feedback on “Naughten says complete shutdown of postal services was 'undeniable' before retirement package plan”.